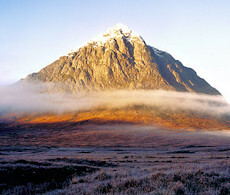 Buachaille Etive Mor, the 'big shepherd of Etive', is an imposing mountain, rising dramatically above Rannoch Moor and guarding eastern approaches to Glencoe. 'Curved Ridge' is a superb Grade 3 scrambling route aiming directly for the Buachaille's northern Munro summit, Stob Dearg. 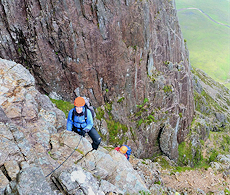 After the Aonach Eagach, 'Curved Ridge' is the most popular and well known rock-scramble in the Glencoe area. The holds are good, the difficulties are never too sustained and the views are exhilarating. 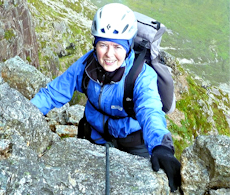 A guided day rock-scrambling up Etive Mor via Curved Ridge. Clamber up the ridge, a summer Grade 3 rock-scramble and 'moderate' rock-climb. Reach superb vantage points such as Crowberry Tower from where vast views can be savoured. 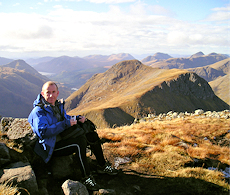 Bag the Munro summits of Stob Dearg and Stob na Broige. 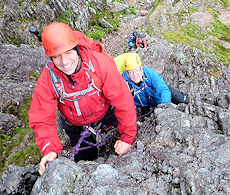 Improve your rock-scrambling skills on one of Scotland's finest scrambling routes. Rock-scrambling to Grade 3 and moderate rock-climbing. 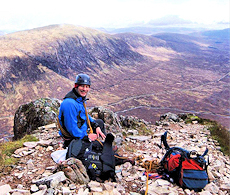 This day event is a guided hill-hiking and rock-scrambling day in the Glencoe area of the Central Highlands with an experienced and qualified guide. Our maximum guide to client ratio on this event is 1:3. On this day we're heading up the mountain's 'Curved Ridge', a fine Grade 2/3 scrambling route aiming directly for the Buachaille's northern Munro summit, Stob Dearg. We start from the popular car-park at Altnafeadh and head south on a fine path. After a mere 500m, we'll leave the path behind and aim past Great Gully to the screes below the base of the crags. At this point, some people find identifying Curved Ridge route confusing, however your guide will know the route well and which options to take. Leaving the screes below, the route becomes exposed, but with only one section of tricky scrambling. Higher up, we can scramble over Crowberry Tower, or take an easier, but exposed path around this. The summit of Stob Dearg is gained, from where (depending on conditions and group desire) we can extend the route to include Stob na Broige, the other Munro summit on the mountain. The route begins on a fine path leading to rough terrain higher up. The ascent and distance covered suggest a 'moderate' graded day. However, our intended route takes in some rock-scrambling up to Grade 3 / 'moderate' climbing and some of this is exposed and airy. Your guide will have ropes and other climbing gear. We will supply you with a climbing harness and helmet, but if you prefer, you would be very welcome to bring your own. 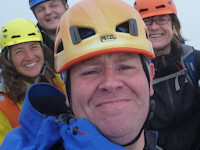 MIC, IML qualified and more, Alan's first love is helping people become more independent in going to the crags and mountains. Leading the events on 20 Sep'19. We'll meet at Altnafeadh, which is on the A82, around 4km west of Kingshouse Hotel. There are bus services that run between Glasgow and Fort William to Kingshouse Hotel and also stop in Glencoe.